Home » Lee Edition » Pain Management What Are Your Options? Pain Management What Are Your Options? and 1.5 billion people worldwide suffer from various types of chronic pain disorders ranging from fibromyalgia, osteoarthritis, neuropathy, back, hip, and neck pain just to name a few. Whether trauma or degenerative disease has caused your pain, the consensus is usually the same; people want their pain to go away. But how do you know that the options you have been given are right for you? Although surgery is critical in certain situations, finding alternative methods to control or alleviate pain is always the first step in pain management. Korunda Pain Management Center is a state of the art facility that specializes in the treatment of acute and chronic pain. We provide the utmost quality care for our patients and address their pain management needs. Physical therapy has been shown to be highly effective in controlling pain for many patients through the implementation of an individualized program. These customized programs may include interventions such as strengthening and stretching exercises as well as manual therapy. Herniated discs, inflammation, and pinched nerves are often the cause of back and neck pain. Image-guided epidural injections can accurately deliver medications near the affected nerve to reduce the swelling and decrease pain. Once the pain-generating nerve(s) are determined, a small lesion is created through the controlled heating of a needle probe using low-energy, high-frequency alternating current. This will interrupt the pain signals to the brain and therefore block the pain transmission. The entire procedure may take approximately 20-30 minutes and patients can resume normal activities within a short period of time. Radiofrequency ablation may treat other areas of the body as well. It is commonly used for cervicogenic headache, trigeminal neuralgia, neck pain, back pain, knee pain, and sacroiliac joint pain. For muscle knots and painful spasms, trigger point injections are performed using anesthetic medication into the affected region to relieve the pain and tightness. Cortisone injections into peripheral joints may help reduce painful inflammation, however, regenerative treatment options such as platelet-rich plasma and stem cell injections may promote healing of damaged tissue. 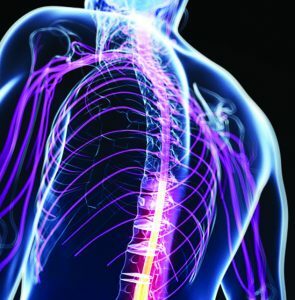 Spinal cord simulation (SCS) is FDA approved and has been around for decades with a proven success rate. Over the past several years, much advancement has been made to the device, making it smaller, more precise, and compatible with MRI imaging. SCS is a type of neurostimulation. It effectively interrupts the pain singals before they reach the brain through mild electrical pulses on the spinal cord. time to make the correct decision for the patient’s specific needs. When the trial period is over, the stimulation leads are removed during an office visit. After a successful trial period, the implantation of the SCS can be done under general anesthesia, or in some cases with “twilight” anesthesia, where the patient is minimally under sedation. Depending on the specifics of the patient’s health and general wellbeing, it’s usually performed in an outpatient facility. Medications such as anti-inflammatory drugs, topical analgesics, or nerve blocking agents, play a role in the comprehensive treatment of painful conditions. At Korunda Pain Management, we strive to deliver the highest quality of comprehensive care for those suffering from acute and chronic pain. We have many therapeutic options to help you with your personal pain management needs. Please visit www.korundapmc.com or call us at (239) 591-2803.